The latest entrant to the tablet arena is Barnes & Noble’s new Nook HD line. The Nook line offered the ability to spend one hour of free EBook reading in any physical Barnes and Noble Store which in a big plus in our opinion. 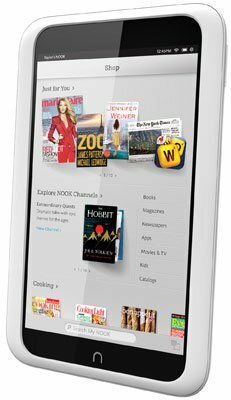 The 7-inch Nook HD features a screen resolution of 1440 x 900 and supports 720p video; Barnes & Noble says that’s 25% more pixels than the Kindle Fire HD. Nook Profiles allows users to set up multiple profiles on one tablet. Adults and children have password protected content so you can rest assured that Bambi is not reading your material. It does make a good kids tablet at this price. It has one of the largest collections of interactive books for kids. It will be available for http://www.gizmotakeout.com users in early November 2012 for 15 dollars. The Simple TV shot to fame as the winner of the Best of CES 2012 and People’s Voice Awards. It is designed for people who want to get rid of expensive cable connections, but are shy of buying any hardware because of cost considerations. We think this has enormous potential and our users will love the experience and the ease of use. 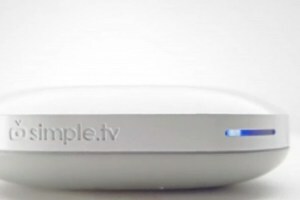 Simple.TV is a personal DVR that streams live and recorded TV programs to web-connected devices like a computer, the iPadTM or RokuTM media streamer. In general, Simple.TV works with all unencrypted TV signals from antennas and digital basic cable, which includes all the major broadcast networks. Most customers will be able to receive FOX, NBC, CBS, ABC, PBS, CW and many customers will also be able to receive channels like Discovery and SyFy. Connect to your network router via Ethernet port Ethernet (Cat-5 cable). Watch your live TV on Chrome, Firefox and Safari browsers. IT IS VERY SIMPLE ACTUALLY. Try this and if this option works without much hassle then you will feel more comfortable cutting the cable cord. This is a Google product that is in our opinion ahead of its time. It certainly puts aesthetics over functionality. But we are all about novelty and strive to bring these cool novel ideas to our users to experience. The Nexus Q exterior is bisected by a ring of LEDs. It creates a mesmerizing performance. Any video you want to play through the Q has to be rented or purchased through Google Play. Setup: Just run the power cable to the wall and connect a pair of bookshelf speakers. You’ll need some banana plugs to make your connections, as the Q has no exposed posts and no way to accept raw speaker wire. 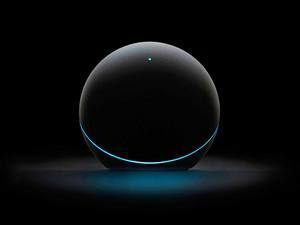 You’ll need a device that can run the Nexus Q app. Tap the compatible Android device on top of the sphere to bring up the Q application in the Google Play store. Install it. To pair with the Q, the app must use Bluetooth — but only for a few moments. After that, all communication with the device uses Wi-Fi. You can play media only through the Google Play media apps (music and videos) and push YouTube videos to the Q. Nothing more. It is a beautiful fall day, and we have solved a major problem. Our world is becomming increasingly connected and we just HAVE to plug in. The options to plug in are diverse and expensive. What works for one person just will not work for others, since basically we are all different. Case in point is the Samsung Galaxy Note 5.3 inch screens. Who would have known that some people would LOVE that. Now, most of us would shy away from a purchase like that since it is unconventional and takes us away from the safety of the herd mentality. A lot of us are DESPERATE to try it ONCE and not get locked down with the device price and two year contracts. So that my readers is the problem that gizmotakeout.com solves. 1. It gives consumers the ability to RENT at a fraction of the retail cost. You get to enjoy the device in the comfort of your home without any bloatware loaded (as is the case in electronics retail stores). 2. It gives you ACCESS to several curated technologies that you formerly would never have been able to experience, save read the ravings in tech blogs. 3. You can compare your existing devices to what you want to get next side by side before you buy finally. Good bye buyers remorse. 4. The new gadget at home feeling accompanies every device. Over the next several days we will let you into more of where we want the site to go. We welcome you to check us out at http://gizmotakeout.com.